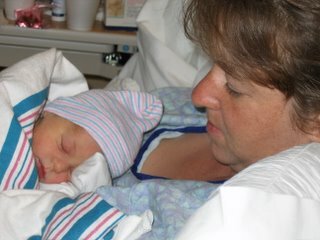 Cary Irene, born Tuesday, October 25th, 2005. She was born on her due date, right on time! We're both doing great. We came home from the hospital yesterday (Friday). My delivery was not at all what I expected, as I ended up having an emergency C-section. Who woulda thunk it? A problem-free pregnancy, no complications of any kind, but you just never know. I had progressed well, getting to 5 centimeters dilated, completely effaced, and the baby was in position. But then, my uterus started working too well. The contractions were so strong that the placenta was separating from the wall of the uterus. The baby's heart rate went down and blood was not getting to her. I had no idea what was going on because I was having non-stop, intense contractions, and could not focus on anything other than the pain. My doctor finally got up next to my face and said that she recommended having a C-section, and I immediately agreed. The doctors and nurses did such an amazing job, and they were able to deliver the baby safely and keep me awake for the whole thing. I'm so thankful for having such great care and being at such a good hospital. Erick was there for the whole thing, of course, and he was amazing. He never showed how scared and worried he was, just held my hand through the whole thing. My mom was there too, and she was also perfect, a very calming presence. I don't feel at all dissapointed or cheated by having had a C-section, since there was just no other way to go at that point. I'm just really surprised that it worked out that way. But the baby!! She is doing soooo well! She's eating like a champ, and already has gained back her birthweight. It was nice to come home yesterday, and she seems more relaxed now, too. Thanks, everyone for all of your prayers. I'm going to go eat now, before the little girl wakes up. Yay! Congratulations! She's adorable! Too bad about the C-section, but in an emergency situation you have to do what you have to do. Thank heavens for modern medicine. She is gorgeous!! So glad you are both home and doing well! Knew there had to be a reason for all those urges to pray for you guys... thanking God for her safe delivery and the care & skill of your delivery team! Welcome to the Mommy Club! And congratulations to your husband - sounds like he did a fantastic job too! Congrats, I am very happy for all three of you!!! So is that Cary as in Cary Grant? I don't know any other Carys - where else might you have gotten it? So glad to hear the nursing is going so well! And that you are napping. Resting and feeding the baby is your whole agenda these early days!